Diabetes mellitus is a chronic condition that requires complex management; however, the time of health care providers is limited and patient motivation varies. How can health care providers design realistic treatment plans and establish priorities that maximize health benefits for patients? The 2008 Canadian Diabetes Association clinical practice guidelines1 (available online at www.diabetes.ca/for-professionals/resources/2008-cpg/) provide some suggestions to help meet these challenges. Although the guidelines cover a wide range of topics, our review is focused on the sections related to the management of cardiovascular disease. Cardiovascular disease is the main cause of death among patients with diabetes mellitus. Over the last decade, there has been a 15% decline in all-cause mortality and cardiovascular disease among people with diabetes, likely as a result of improved treatment and control of risk factors.2 Nevertheless, there is still room for improvement. In the following review, we consider the recommendations about the management of cardiovascular disease risk factors according to the magnitude of the health impact, strength of evidence, ease of implementation and how often they are followed, on average, compared with how often they could be followed. Average quality of care was obtained from a Health Quality Council report on diabetes in Saskatchewan from 2003 to 2004.7 Because this province has universal insurance for pharmaceuticals and a centralized database for laboratory results, information about diabetes care is available for the entire population. The best case scenario for clinical practice is based on the results of the Steno-2 trial.8,9 This randomized trial, performed at a diabetes centre with a team of health care providers (nurse, doctor, dietitian) and regular follow-up, reported that intensive control of risk factors reduced all-cause mortality by 46% compared with usual care. The staff and resources in this study may exceed those in many clinics, and the patient population included was at higher risk than people in the general population, however, Steno-2 is the only published large, long-term trial of a multifactorial intervention to prevent complications of diabetes. Thus, it serves as a “gold standard” for what may be achieved in clinical practice. A comprehensive search of various electronic databases for relevant English-language, published, peer-reviewed studies was performed by chapter authors and independently by a librarian using validated search strategies. Full details of the search are included in the Canadian Diabetes Association guidelines.1 Each citation referenced in a new or modified recommendation was assigned a level of evidence by use of standardized checklists. Health benefits, risks and adverse outcomes of interventions were considered in the formulation of the recommendations. Recommendations were assigned a grade from A through D based on the relative strengths of the studies from a methodologic perspective and the studies' findings (Box 1, Table 1). 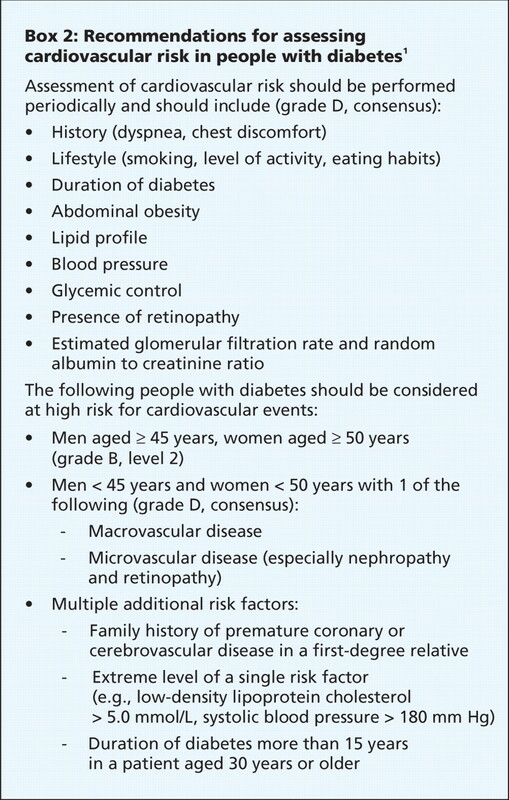 The degree of benefit from a medical intervention is based on the absolute risk of vascular events, with patients at higher risk deriving greater benefit.7 The 2008 guidelines state that men aged 45 or more years with diabetes and women aged 50 or more years with diabetes should be considered to be at high risk of cardiovascular disease (grade B, level 2 evidence). This represents a 20% risk of vascular events over a 10-year period, including nonfatal myocardial infarction or cardiac death.14 These age cutoff points are easy to ascertain and capture most patients at high risk who are most likely to benefit from intervention. Patients below these cutoff points who have 1 or more risk factors for cardiovascular disease are also considered to be at high risk (Box 2). This recommendation is more precise than that in the 2003 guideline, and it reflects a compromise between effectiveness (saving as many lives as possible) and efficiency (minimizing treatment given to people who will derive little or no benefit). Patients aged 40 or more years or with a more than 15-year history of diabetes should have baseline resting electrocardiography performed, and it should be repeated every 2 years for those at high risk (both grade D, consensus). Patients with an abnormal electrocardiography result or chest pain should be referred for stress testing, and those with ischemia at low exercise capacity (< 5 metabolic equivalents) should be referred to a cardiologist (grade D, consensus). The guidelines do not provide other explicit criteria for referral to a specialist. Certain medications have an independent effect on the risk of cardiovascular morbidity and mortality in addition to their effect on risk factors. The Heart Outcomes Prevention Evaluation (HOPE) study15 demonstrated the benefit of angiotensin-converting-enzyme (ACE) inhibition in people with diabetes who are at high risk for cardiovascular disease. A more recent study16 suggested that the effect of angiotensin-receptor blockers is comparable to that of ACE inhibitors in high-risk groups with diabetes. 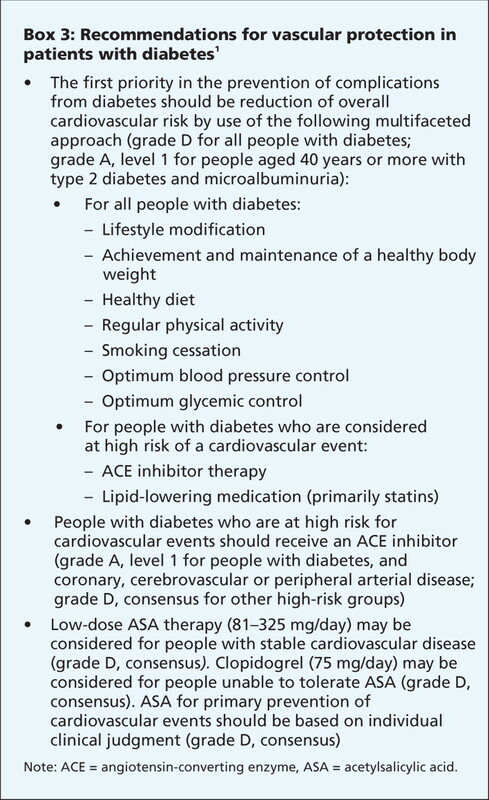 As a consequence, the updated guidelines recommend the use of ACE inhibitors or angiotensin-receptor blockers at doses shown to be cardioprotective for people at high risk of cardiovascular events, even in the absence of hypertension (grade A, level 1A for those with cardiovascular disease; grade B, level 1A for those in other high-risk groups) (Box 3). The recommendation for acetylsalicylic acid (ASA) has been changed as a result of research showing it provides less benefit in terms of reduction of cardiovascular events among patients with diabetes than among those without diabetes.17,18 Thus, low-dose ASA therapy (81–325 mg/day) could be considered for people with stable cardiovascular disease (grade D, consensus). 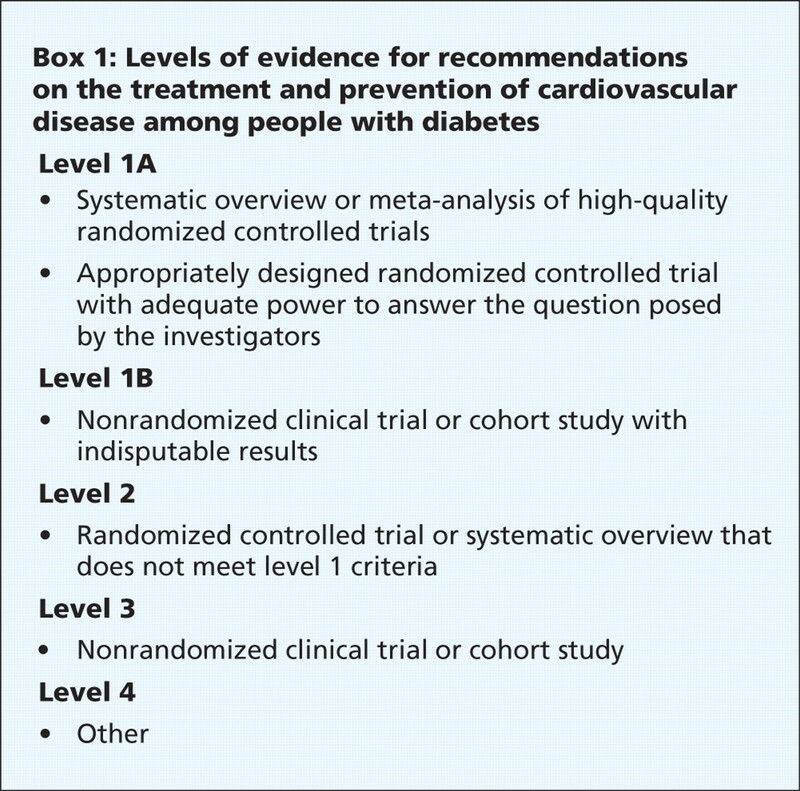 In primary prevention of cardiovascular disease, there is no evidence of a benefit of long-term ASA therapy among patients with diabetes; thus, its use is left to individual clinical judgment (grade D, consensus). Strict control of blood pressure has a large impact on morbidity and mortality in patients with diabetes.19–21 An observational study found that blood pressure control had a greater impact on quality-adjusted life-years than strict control of cholesterol or glycemia.22 The 2008 guidelines recommend that blood pressure be measured at every patient visit (grade D, consensus) and that hypertension be diagnosed according to the national hypertension guidelines (Box 4).23 The treatment targets remain a systolic blood pressure of less than 130 mm Hg (grade C, level 3) and a diastolic pressure of less than 80 mm Hg (grade B, level 2), irrespective of kidney function. First-line treatments include ACE inhibitors, angiotensin-receptor blockers, thiazides (grade A, level 1A for each) and dihydropyridine calcium-channel blockers (grade B, level 2). An ACE inhibitor or angiotensin-receptor blocker is recommended as initial treatment in the presence of microalbuminuria (grade A, level 1A). They are favoured because of demonstrated cardioprotective benefits (grade A, level 1A). Despite the clear benefit of cholesterol control, only 45% of patients with diabetes in Saskatchewan had an LDL cholesterol level of less than 2.5 mmol/L, and only 30% were taking lipid-lowering drugs. In the Steno-2 trial,9 85% of patients in the intensive-treatment group were taking a statin, although this was a high-risk population. Given that cholesterol control often requires taking only 1 tablet each a day, with modest initial dose titration and few adverse outcomes,31 this medication is often an acceptable addition to the many drugs already taken by patients with diabetes. Elevated blood glucose is associated with microvascular and macrovascular complications. However, in randomized trials, improved glycemic control has resulted in reduced microvascular complications, such as nephropathy, but not in reduced cardiovascular events.11,20 The benefits of strict glycemic control are in question, as 1 arm of the Action to Control Cardiovascular Risk in Diabetes (ACCORD) trial,37,38 which was aimed at achieving a hemoglobin A1c level of 6% or less, was stopped prematurely because of 22% higher mortality in the treatment group than in the less-intensive treatment group. Another recent study, the ADVANCE trial,11 showed that an intensive (modified-release) gliclazide-based regimen achieving a median hemoglobin A1c level of 6.5% decreased nephropathy by 21% but did not decrease cardiovascular events compared with conventional treatment (which did not use gliclazide and achieved a median hemoglobin A1c of 7.3%). The ADVANCE trial did not confirm an increased risk of death in the intensively controlled subgroup. Self-monitoring of blood glucose for patients with type 2 diabetes who do not take insulin was given a grade C recommendation because of the contradictory evidence about the benefit, including a recent randomized controlled trial and older meta-analysis that showed no benefit.39,40 A recent trial reported that in addition to having no benefit in patients not taking insulin, self-monitoring caused a small increase in patient scores on the depression subscale of a questionnaire used to gauge well-being.41 For example, glucose test strips are the fourth most expensive “chemical” in the Ontario Drug Benefit program;42 thus, the opportunity cost of this intervention should be considered. Large cohort studies have found that regular physical activity is associated with 39%–70% reductions in cardiovascular and all-cause mortality over 15–20 years of follow-up.43–46 The effect of simply recommending that patients exercise more (which is what most clinicians do) is less certain.47 Structured physical activity counselling by physicians or health care providers has been effective in increasing physical activity and producing modest, sustained weight loss.48–51 The recommendation of 150 minutes of moderate to vigorous aerobic exercise spread over 3 days a week (grade B, level 2) is unchanged from the 2003 guidelines (Box 5). The guidelines also recommend resistance exercise 3 times a week in addition to aerobic exercise (grade B, level 2); resistance exercise can be helpful for people with limited mobility. Finally, a cardiac stress test should be considered for previously sedentary people at high risk of cardiovascular disease who wish to undertake exercise more vigorous than brisk walking (grade D, consensus). What is the best way to reduce the risk of cardiovascular disease? Given the limited time available for regular primary care visits and the range of risk-reduction strategies, it is best to explain the options to patients and to build a long-term treatment plan. Self-monitoring of blood glucose for patients not taking insulin is of uncertain benefit; thus, other behaviours, such as exercise, should be promoted. Consider offering outside resources to support behaviour change, such as exercise programs for motivated patients. Overall, quality of care can be improved through the use of electronic databases, clinical flow charts and automatic reminders (grade B, level 2). Enhancing the role of nurse educators, dietitians and pharmacists can improve coordination of care (grade B, level 2). Case management should be considered for difficult-to-manage cases (grade B, level 2). In conclusion, because cardiovascular disease is the main cause of mortality among diabetic patients, managing cardiovascular risk should be a key treatment goal for providers and patients. Cardiovascular disease is a key focus of the new diabetes guidelines. Men with diabetes aged 45 or more years and women with diabetes aged 50 or more years are at high risk of cardiovascular disease. The priorities for reducing risk of cardiovascular disease are control of blood pressure and cholesterol levels. Strict glycemic control can reduce microvascular complications, but it does not reduce the risk of cardiovascular disease. Control of cardiovascular disease risk factors is imperfectly implemented in current practice. Funding: This authors not receive external funding for this article. It was written independently of the Canadian Diabetes Association guidelines. Editor's note: Gillian Booth is a member of the steering and executive committees for the 2008 Canadian Diabetes Association Clinical Practice Guidelines and was editor of the Methods section of the guidelines. Onil Bhattacharyya and Baiju Shah were not involved in the writing of the 2008 Canadian Diabetes Association Clinical Practice Guidelines but are members of the dissemination and implementation subcommittee. Contributors: Onil Bhattacharyya wrote the first draft of the article. He, along with Baiju Shah and Gillian Booth, revised the manuscript critically for intellectual content and approved the final version submitted for publication. Acknowledgements: Baiju Shah has received funding from the Canadian Institutes of Health Research, the Canadian Diabetes Association and the Banting and Best Diabetes Centre at the University of Toronto. Gillian Booth has received funding from the Canadian Institutes of Health Research, the Ontario Women's Health Council and the Banting and Best Diabetes Centre at the University of Toronto. Booth GL, Kapral MK, Fung K, et al. Recent trends in cardiovascular complications among men and women with and without diabetes. Diabetes Care 2006;29:32-7. National Institute for Clinical Excellence. The guideline development process: an overview for stakeholders, public and the NHS (3rd ed). London (UK): The Institute; 2007. Available: www.nice.org.uk/media/830/B9/GuidelinesManualDevelopmentProcess.pdf (accessed 2008 Sep 6). Australian Centre for Diabetes Strategies. Introduction and overview of the guideline development process. In: National evidence based guidelines for the management of type 2 diabetes mellitus. Sydney (Australia): National Health and Medical Research Council; 2005. Available: www.nhmrc.gov.au/publications/synopses/_files/di7.pdf (accessed 2008 Sep 6). Jackson R, Lawes CM, Bennett DA, et al. Treatment with drugs to lower blood pressure and blood cholesterol based on an individual's absolute cardiovascular risk. Lancet 2005;365:434-41. Chan BT, Klomp H, Castagnette P. Quality of diabetes management in Saskatchewan. Saskatoon (SK): Health Quality Council; 2006. Gaede P, Vedel P, Larsen N, et al. Multifactorial intervention and cardiovascular disease in patients with type 2 diabetes. N Engl J Med 2003;348:383-93. Gaede P, Lund-Andersen H, Parving HH, et al. Effect of a multifactorial intervention on mortality in type 2 diabetes. N Engl J Med 2008;358:580-91. Canadian Diabetes Association Clinical Practice Guidelines Expert Committee. Canadian Diabetes Association 2003 clinical practice guidelines for the prevention and management of diabetes in Canada. Can J Diabetes 2003;27:(suppl 2). Available: www.diabetes.ca/cpg2003/downloads/cpgcomplete.pdf (accessed 2008 Sep 6). The ADVANCE Collaborative Group. Intensive blood glucose control and vascular outcomes in patients with type 2 diabetes. N Engl J Med 2008;358:2560-72. Kahn SE, Haffner SM, Heise MA, et al. Glycemic durability of rosiglitazone, metformin or glyburide monotherapy. N Engl J Med 2006;355:2427-43. Woolf SH, Grol R, Hutchinson A, et al. Clinical guidelines: potential benefits, limitations, and harms of clinical guidelines. BMJ 1999;318:527-30. Yusuf S, Sleight P, Pogue J, et al. Effects of an angiotensin-converting-enzyme inhibitor, ramipril, on cardiovascular events in high-risk patients. Heart Outcomes Prevention Evaluation Study Investigators. N Engl J Med 2000;342:145-53. ONTARGET Investigators, Yusuf S, Teo KK, et al. Telmisartan, ramipril, or both in patients at high risk for vascular events. N Engl J Med 2008;358:1547-59. Aspirin effects on mortality and morbidity in patients with diabetes mellitus. Early Treatment Diabetic Retinopathy Study report 14. ETDRS Investigators. JAMA 1992;268:1292-300. The CDC Diabetes Cost-effectiveness Group. Cost-effectiveness of intensive glycemic control, intensified hypertension control and serum cholesterol level reduction for type 2 diabetes. JAMA 2002;287:2542-51. UK Prospective Diabetes Study Group. Intensive blood-glucose control with sulphonylureas or insulin compared with conventional treatment and risk of complications in patients with type 2 diabetes: UKPDS 33. Lancet 1998;352:837-53. Schmittdiel J, Vijan S, Fireman B, et al. Predicted quality-adjusted life years as a composite measure of the clinical value of diabetes risk factor control. Med Care 2007;45:315-21. 2008 CHEP recommendations for the management of hypertension. Canadian Hypertension Education Program (CHEP); 2008. Available: http://hypertension.ca/chep/wp-content/uploads/2008/03/2008-chepspiral-booklet-final_jan28.pdf (accessed 2008 Sep 6). Whelton PK, Barzilay J, Cushman WC, et al. Clinical outcomes in antihypertensive treatment of type 2 diabetes, impaired fasting glucose concentration, and normoglycemia: Antihypertensive and Lipid-Lowering Treatment to Prevent Heart Attack Trial (ALLHAT). Arch Intern Med 2005;165:1401-9. Leenen FH, Dumais J, McInnis NH, et al. Results of the Ontario survey on the prevalence and control of hypertension. CMAJ 2008;178:1441-9. Resnick HE, Foster GL, Bardsley J, et al. Achievement of American Diabetes Association clinical practice recommendations among U.S. adults with diabetes, 1999–2002: the National Health and Nutrition Examination Survey. Diabetes Care 2006;29:531-7. Bremner AD. Antihypertensive medication and quality of life — Silent treatment of a silent killer? Cardiovasc Drugs Ther 2002;16:353-64. Verberk WJ, Kroon AA, Kessels AG, et al. Home blood pressure measurement: a systematic review. J Am Coll Cardiol 2005;46:743-51. Canadian Diabetes Association Clinical Practice Guidelines Expert Committee. Dyslipidemia in adults with diabetes. Can J Diabetes 2006;30:230-40. Available: www.diabetes.ca/files/CJDSep06Lipids.pdf (accessed 2008 Sep 6). Zhou Z, Rahme E, Abrahamowicz M, et al. Effectiveness of statins for secondary prevention in elderly patients after acute myocardial infarction: an evaluation of class effect. CMAJ 2005;172:1187-94. Law M, Rudnicka AR. Statin safety: a systematic review. Am J Cardiol 2006;97:52-60C. Statin safety: a perspective. Bandolier 2006;147. Available: www.medicine.ox.ac.uk/bandolier/band147/b147-3.html (accessed 2008 Sep 6). Mitka M. Contradictory findings ignite questions about blood glucose targets in diabetes. JAMA 2008;299:1413-5. Action to Control Cardiovascular Risk in Diabetes Study Group. Effects of intensive glucose lowering in type 2 diabetes. N Engl J Med 2008;358:2545-59. Heller SR. Self monitoring of blood glucose in type 2 diabetes. BMJ 2007;335:105-6. O'Kane MJ, Bunting B, Copeland M, et al. Efficacy of self monitoring of blood glucose in patients with newly diagnosed type 2 diabetes (ESMON study): randomised controlled trial. BMJ 2008;336:1174-7. 2005/06 report card for the Ontario Drug Benefit Program. Toronto (ON): Ministry of Health and Long Term Care; 2008. Available: www.health.gov.on.ca/english/public/pub/ministry_reports/odb_report05/odb_rep_05_06.pdf (accessed 2008 Sep 6). Hu G, Jousilahti P, Barengo NC, et al. Physical activity, cardiovascular risk factors, and mortality among Finnish adults with diabetes. Diabetes Care 2005;28:799-805. Hu FB, Stampfer MJ, Solomon C, et al. 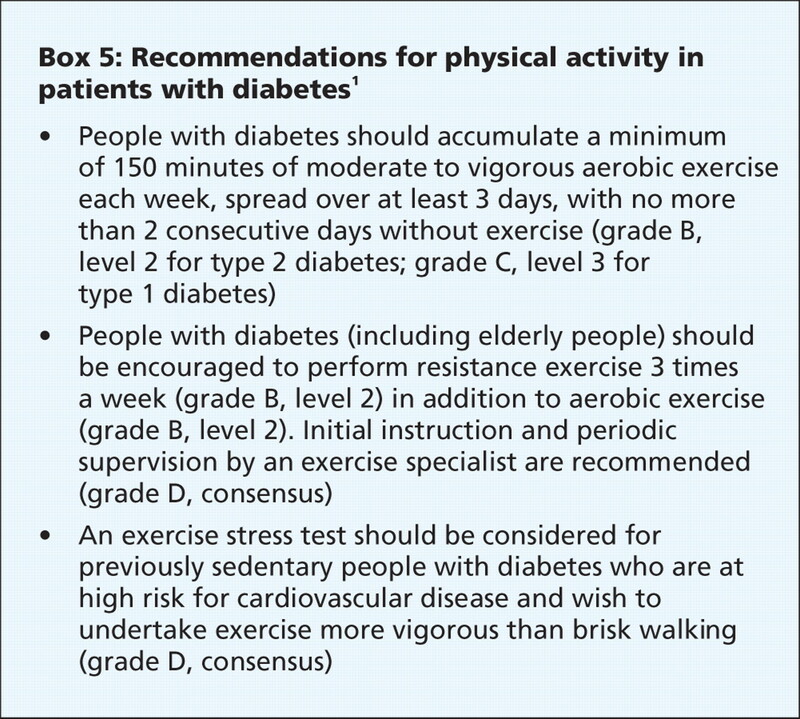 Physical activity and risk for cardiovascular events in diabetic women. Ann Intern Med 2001;134:96-105. Church TS, LaMonte MJ, Barlow CE, et al. Cardiorespiratory fitness and body mass index as predictors of cardiovascular disease mortality among men with diabetes. Arch Intern Med 2005;165:2114-20. Harris SB, Petrella RJ, Leadbetter W. Lifestyle interventions for type 2 diabetes. Relevance for clinical practice. Can Fam Physician 2003;49:1618-25. Petrella RJ, Koval JJ, Cunningham DA, et al. Can primary care doctors prescribe exercise to improve fitness? The Step Test Exercise Prescription (STEP) project. Am J Prev Med 2003;24:316-22. Kirk A, Mutrie N, MacIntyre P, et al. Effects of a 12-month physical activity counselling intervention on glycaemic control and on the status of cardiovascular risk factors in people with Type 2 diabetes. Diabetologia 2004;47:821-32. Wolf AM, Conaway MR, Crowther JQ, et al. Translating lifestyle intervention to practice in obese patients with type 2 diabetes: Improving Control with Activity and Nutrition (ICAN) study. Diabetes Care 2004;27:1570-6. Norris SL, Zhang X, Avenell A, et al. Long-term non-pharmacologic weight loss interventions for adults with type 2 diabetes. Cochrane Database Syst Rev 2005;(2):CD004095. Feldman R. Simplified Therapeutic Intervention to Control Hypertension (STITCH) Trial. Final results. 2007 American Heart Association Meeting; 2007 Nov 8; Orlando (Flordia). Antiplatelet Therapy for Every Diabetic Person?